On September 4 2014 FCC Chairman Tom Wheeler delivered a speech “The Facts and Future of Broadband Competition” at 1776 in Washington DC. 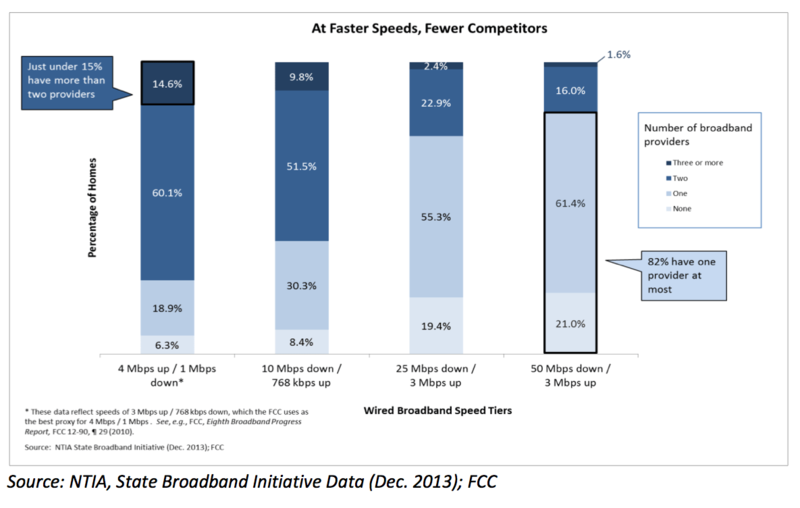 While currently the FCC defines broadband as a 4/1mbps Internet connection, and is considering raising that to 10/?mpbs, Chairman Wheeler suggested that, given the number of devices in the average home, 25mbps down was “table stakes in 21st century communications”. Deprecating the abilty of DSL or wireless to meet the demand, he outlined the lack of competition in the current marketplace, as indicate in the chart below. Where competition exists, the FCC will protect it. Where greater competition can exist, the FCC will encourage it. Where meaningful competition is not available, the FCC will work to create it. Where competition cannot be expected to exist, the FCC must shoulder the responsibility of promoting deployment. On the topic of net neutrality he affirmed his belief that “minimum service requirements will suffice”, and made no comment about mergers.